We received media passes to review the park. As always all opinions are honest and solely those of mine and JustaBXgirl. Once upon a time I used to spend my birthday traveling abroad and dancing on tables. Since becoming a mom it has become a bit more calm. This year I decided to get a little wet and wild by getting two of my cousins together with me and JustaBXgirl, jumping in my cousin’s car and heading out to Long Island. Heading to Long Island has been a summer ritual of mine for as long as I can remember. I have family that lives there and it’s a regular jaunt to invade some relative’s home and pool. This trip would be a bit different. Rather than heading straight for the family pools we headed out for some family fun at our local water park, Splish Splash. Yup, how cool is it that I can call Splish Splash my local water park? It’s less than an hour and a half by car from the Bronx to Splish Splash Water Park and if you know NYC then you know that’s less time than it would take me to get to Brooklyn from the Bronx by public transportation. Without further ado here are my top 3 favorite things about Splish Splash. Please forgive my blurry photos. I have my phone in a waterproof case all day. Keep Kids Safe Program – I’ve gone to a lot of amusement parks and maybe I just don’t pay enough attention but I haven’t noticed this anywhere else. When you get to the park you simply go to Guest Services and register your child. Your child receives a numbered bracelet that corresponds to a log book where you enter your name, number and child’s name. If your child gets separated from you in the park a staff member will bring them to Guest Services and you will be called. I usually leave my business card in JustaBXgirl’s shoe but seeing how she was wearing flipflops for the day this is a great option. My cousin was brave enough to take her phone out of her water case! Lazy River – I was a little worried about taking JustaBXgirl on a lazy river. If you have ever been around a four year old you know until you need them to do something lazy isn’t really in their vocabulary. My worries were for naught. JustaBXgirl loved the lazy river and even wanted to go on more than once. I do wish that they had smaller tubes for littles but even with the one sized ones my petite little, JustaBXgirl was able to enjoy the ride. I can admit though that going through a lazy river with my hand locked onto a four year old’s tube was not the most lazy thing this mama has ever done. It was however tons of fun. Since I don’t know how to swim JustaBXgirl wouldn’t let me got past a certain line. Here’s me while she goes off to the deep side with the girls! Kahuna Bay Wavepool – We spent most of the day here. Yup, the Kahuna Bay Wavepool is the reason we only saw half the park. I can admit that I don’t think I’ve had this much fun in a really long time (and part of my job is to have fun). Jumping waves with my cousins and JustaBXgirl was definitely an amazing way to celebrate my birthday. There is soooo much to do at this 96 acre amusement park. A few things to consider when you plan your trip, bring sealed water bottles. You cannot bring outside food or drinks EXCEPT for sealed bottles of water. Freeze them to make them last all day long. Bring your own Coast Guard Approved life jackets. You can use one at the park but if you’re little is anything like mine they will prefer having their own. Also, on a busy day the park might not have one available when you need it. Go early and get on the rides. It seemed like every time we got off of a ride the line tripled behind us. Oh and one thing that is really, really cool is that they have a shuttle from the LIRR!!!! Yup, no need to drive there for all of my car-less NYC people. Have you been to Splish Splash before? What’s your favorite part of the park? 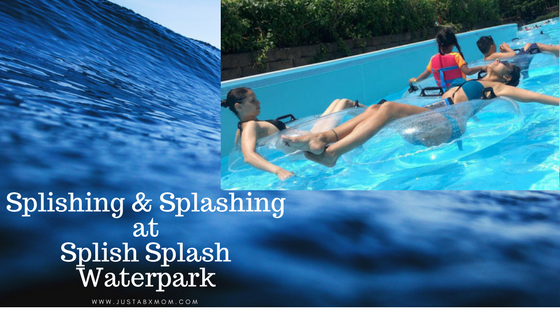 I’ve never been to Splish Splash, but my writer has gone and loved it. I’d stay in that Kahuna Wave pool all day myself. Is Your Family Part Of The Passport Gang?